Who dares say that there is nothing to see in nature? The tree giants have been torn naked and their silhouettes are awe-inspiring. The Urvaste Tamme-Lauri oak grows on a flat field behind the Urvaste schoolhouse, at the Urvaste-Kanepi road. 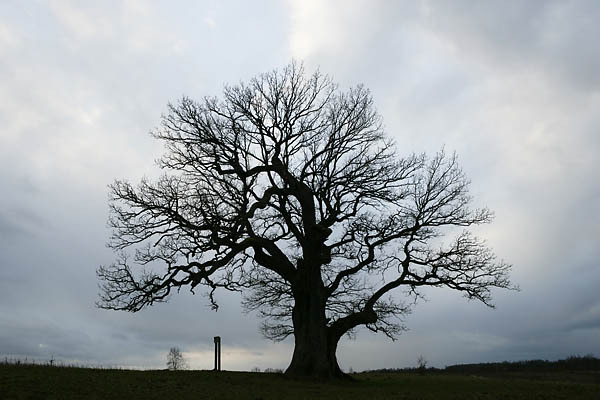 Whether it is a grove tree or a tree god, it is the last silent witness of the oak forest that once grew there. Tamme-Lauri’s crown is seventeen metres wide, the height is the same although the tip was broken off long ago. The circumference of the trunk at breast height is eight metres, or, to embrace the giant a chain of five men would be needed.